That’s the total number of views this little Degrassi blog I created had in its very first month. Ten views…and I’m guessing all of them were from me. I technically started DegrassiBlog.com in the summer of 2008. You’re old if you remember the days of calling Stephen Stohn “The Exec,” and him posting news on his Myspace and Degrassi.tv. I made a few posts, got bored and gave up. Blogging/vlogging, etc isn’t difficult, but it’s difficult to keep doing because to get any traction you have to do it regularly. And once you get out of the habit of doing it, it’s basically game over (i.e. every defunct fansite that tried to make a comeback after going on a hiatus). In the summer of 2009, I decided to fire up this blog again and put a little more commitment into it. The rest is pretty much history. I never would’ve expected this site to hit 1 million views, let alone 10 million and the plethora of unique opportunities that have come with it. Thank you to all of you who’ve bothered to come to this site for whatever reason. Degrassi has been a daily part of my existence for over a decade now, and I can tell you that the Degrassi fandom is the reason this site exists. 1) To have a place where people can find Degrassi info in one place. Boy did I get lucky, because I started this site at a time where there weren’t as many places to discuss Degrassi as there had been during the golden fandom years of 2004-2007. We have it so easy these days; Degrassi news is basically handed to us on a silver platter. Back in the day, you had to actually research the web to find stuff (Degrassi Online knows what I’m talking about). 2) To pay homage to the Degrassi fansites that came before me. You’re an ancient fan if you remember any of these. Degrassi-tng.com was one of the first fansites I ever stumbled across. Run by a girl named Ashley, they posted news and media. There were so many fans who tried to emulate this site, but this one was always one of the biggest. Degrassi The Next Generation Hangout (Degrassi TNGHO) was 10000000% crucial to my Degrassi fan experience. I started watching Degrassi in 2004, during the middle of season 3. After becoming obsessed and discovering the online fandom, I heard somewhere about some episode that was so controversial The-N refused to air it (Accidents Will Happen). My search took me to the Degrassi TNGHO Yahoo group, where they made episode downloads available through a program called Soulseek. Degrassi fans these days have been spoiled by Epitome’s desire to make sure the episodes are aired in Canada and the U.S. at the same time. Back then, episodes were airing in Canada MONTHS before they’d air in the U.S., and Degrassi TNGHO made it so that us Americans could keep up with Canada’s broadcast schedule. 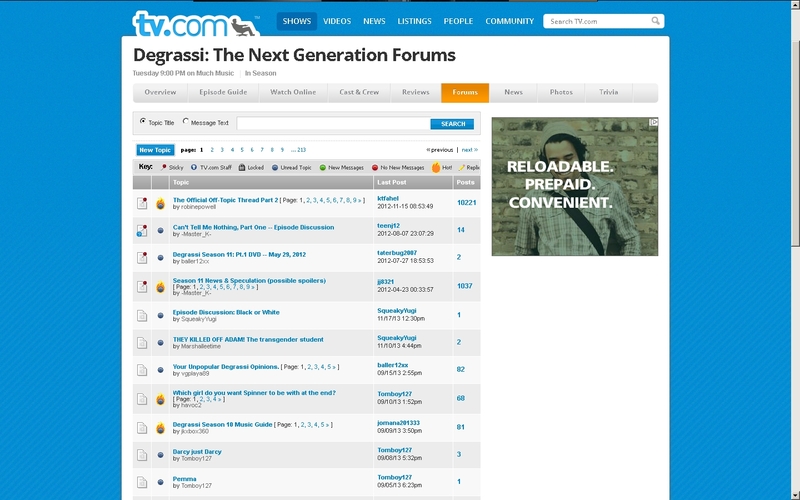 The Degrassi forums over at TV.com is where I spent a majority of my time in the early years. There’s so many other sites that have come and gone over the years: Lauren-Collins.net, Degrassi Junkie, Boycott The Caf, The Degrassi Boards, Degrassi Nation, the Degrassi.tv “Shooting Season 3” thread and The Degrassi Experience. The same goes for fans of the show. People enter and leave the fandom for various reasons, whether it’s because they get tired of the show or the grind of real life and entering adulthood sweeps them away. Even I don’t post as much as I used to…I have no desire to quit watching the show, but because of real-world responsibilities I can’t obsess over it 24/7. I remember thinking back during season 11 (2011) that the fandom at the time would naturally be completely different five years down the road (2016) regardless of what happens, and that’s well on its way to being true. The only constants are that these sites and the multiple generations of fans have had an impact on me, and the fact that this notorious school manages to stick around through every high and low. “Whatever it takes, I know I can make it through.” That’s a phrase Degrassi seems to take to heart, even as its characters and fans grow up and move on. Thank you for stopping by DegrassiBlog during your trip, no matter how long it may be, through this Degrassi universe. Congratulations Kary! 10 million views is quite an accomplishment in blogs these days. You’ve managed to succeed where so many others have failed, you should be proud of your site. Although I’ve watched the show almost from the beginning, I really started to pay attention when DeGrassi (TNG) approached the 10 year milestone. Shows that surpass a decade are pretty rare, regardless of their target audience. In many ways, the road DeGrassi traveled was much more difficult than other long surviving shows have had to navigate. Throughout a lot of it, you’ve provided excellent commentary and coverage. Well done! Hope both you (and the show, of course) log up another 10 mil! congrats, Kary. I think everyone here will agree with me that we are all very happy you started this blog and keep it updated. WOW! Good job Kary… Thank you for keeping us all up-to-date with all the latest Degrassi news. We’d all be lost without you! Many congrats Kary :) Thanks to you we learn so much! Thank you & congrats, Kary! I discovered your blog back in 2009ish & before then, I didn’t have many friends who watched the show, and so I longed for a community to talk to about it and share thoughts. This became that place for me! Thanks again, you do awesome work! As a fan of a…ahem…certain advanced age, I’ve enjoyed reading commentary about my #1 guilty pleasure from the perspective of a fellow adult over the years. Congrats, Kary! That’s awesome to hear Kary. Even though I haven’t seen the show since the 12th season it’s thanks to you that I know what’s going on. Here’s to another 10 million. Thank you for loving Degrassi as much as I do!! I have been reading your posts/reviews since 2010. Not many people understand why I love Degrassi (I started watching in 2004 as well) and especially being in the US it’s hard to come across people who are fans! So it’s always been nice to come here and be surrounded by people who love this show like I do! Thank you for keeping this blog up and for devoting your time and energy to it! “Degrassi TV” Coming Soon…Submit Your Videos!